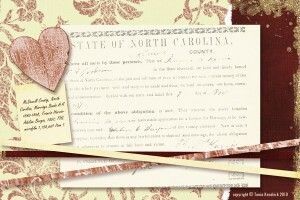 On this date in 1857, Francis Harris obtained a marriage bond in McDowell County, North Carolina. His intended bride was Adeline Burgin. 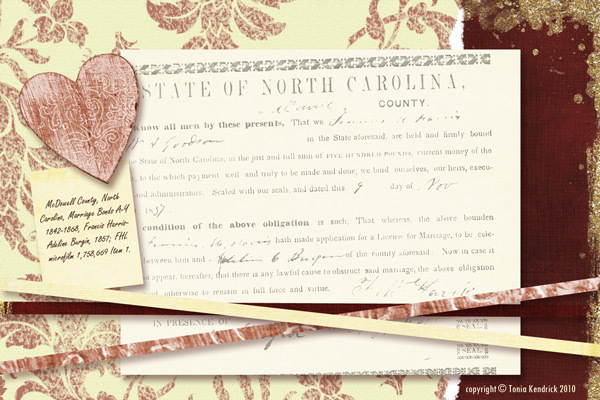 I found the record while searching the FHL microfilm of McDowell County Marriage Bonds. I wasn’t sure who Francis and Adeline were at the time, but since Adeline was a Burgin, I made a copy of the record. Some quick research back at home revealed that Francis M. Harris had married Adeline Crawford Burgin. Adeline turned out to be the daughter of Martha Burgin and the granddaughter of Benjamin Burgin and Leah Mann. Ben and Leah are my 6th great-grandparents, so Adeline does indeed fit into my family tree. In fact, I found her sister, Rosamond Malinda, through the same process. Adeline and Rosamond’s father is Jesse Burgin – I don’t know who he is yet, but feel certain he will be connected to my Burgins as the name Jesse Burgin already appears several times in my tree.